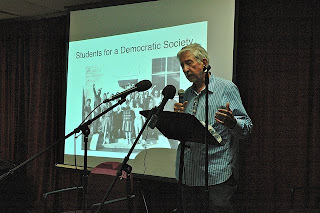 Tom Hayden speaks on "The Drug War, the Peace Movement, and the Legacy of Port Huron" at the 5604 Manor Community Center in Austin, Saturday, August 25, sponsored by The Rag Blog and Rag Radio. Video produced by Jeff Zavala of ZGraphix. 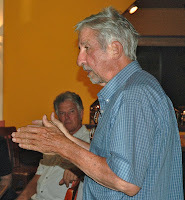 AUSTIN, Texas -- Progressive activist, New Left pioneer, and former California state senator Tom Hayden spoke on “The Drug War, the Peace Movement, and the Legacy of Port Huron” on Saturday, August 25, 2012, before an enthusiastic packed house at the 5604 Manor Community Center in Austin. He also appeared before a group of Austin activists at a South Austin Mexican restaurant the night before. 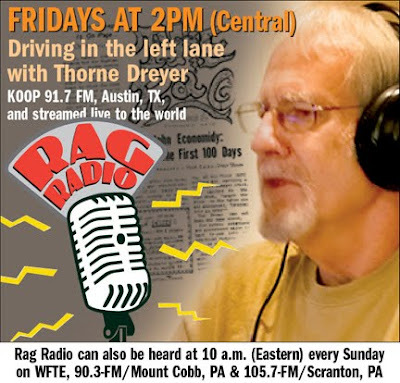 Both events were sponsored by the New Journalism Project, the nonprofit that publishes The Rag Blog, and by Rag Radio. 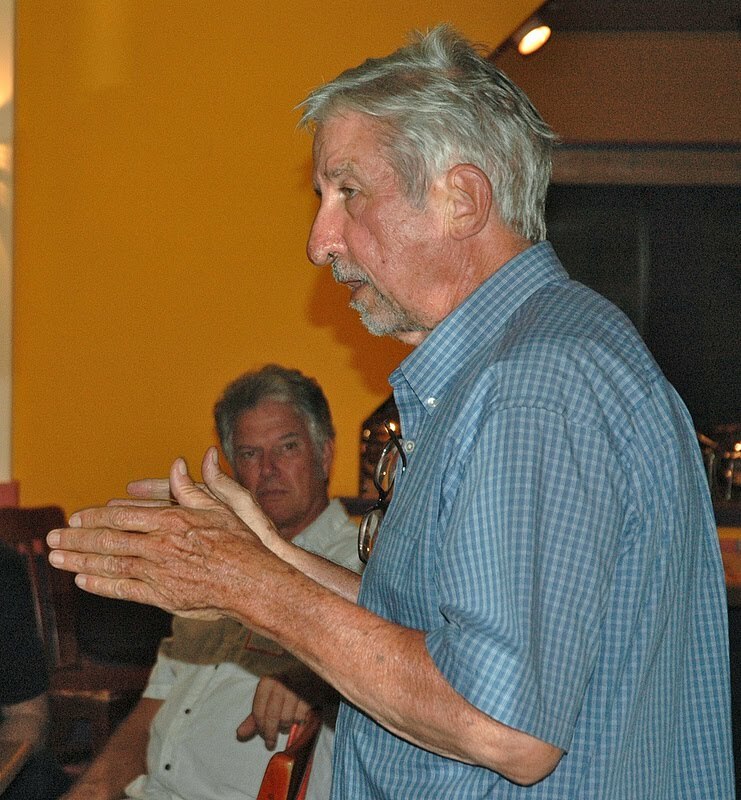 Tom Hayden addresses August 25 crowd at Austin's 5604 Manor Community Center. Inset below: Hayden raps with Austin activists at gathering the previous night. Photos by Carlos Lowry / The Rag Blog. Hayden was also in Austin as a correspondent for The Nation, covering Mexican poet Javier Sicilia’s Caravan for Peace, which aims at ending the U.S.-sponsored Drug War and which held a rally at the Texas State Capitol at noon that Saturday. Hayden, who spent 16 years in the California state legislature, where the Sacramento Bee called him the “conscience of the Senate," and is the author or editor of 19 books and a regular contributor to The Rag Blog, has been putting much of his energy into his outspoken criticism of America’s “long war" in Iraq, Afghanistan, and elsewhere, because of the way it “robs our domestic potential.” He now directs the Peace and Justice Resource Center in Culver City, California, and edits the Peace Exchange Bulletin. After his visit to Austin, Hayden wrote at The Nation about Sicilia's Caravan for Peace: "This is a far different peace movement than the ones American officials and media are used to seeing. For the first time in memory, a caravan of Mexicans have crossed the border north to demand that the U.S. government take responsibility for its major part in the mayhem" caused by the drug war. Members of Javier Sicilia's Caravan for Peace -- who have lost loved ones to the War on Drugs -- demonstrate at the Texas Capitol, Saturday, August 25, 2012. Photo by Mariann Wizard / The Rag Blog. 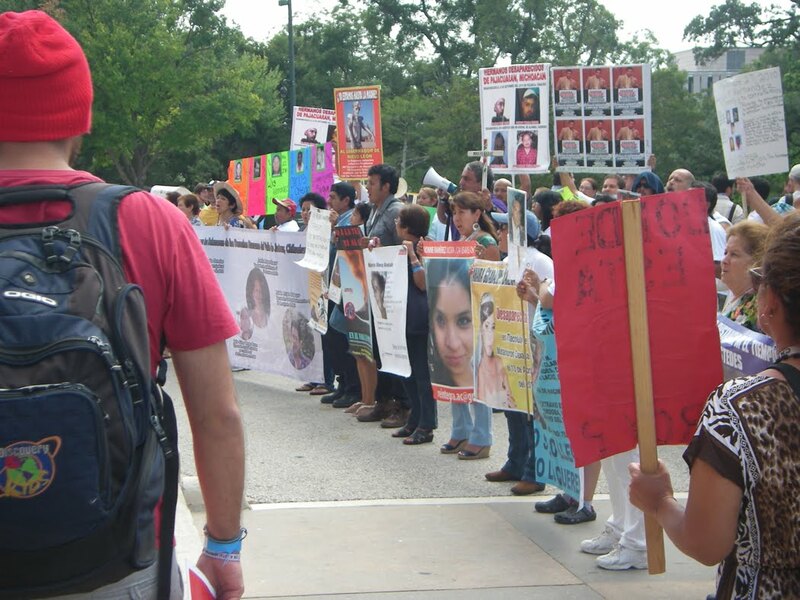 "The core of the movement," he wrote, after interviewing Sicilia in Austin, "is composed of Mexican victims of violence who are calling for the end of the militarized approach to drugs policy," adding that Mexicans and others in Latin America "have had enough of tougher law-and-order (mano dura) crackdowns, police buildups, impunity for the powerful, corrupt judiciaries, dictatorships and torture chambers..."
Sicilia, who was moved to action after his son was killed in drug war-related crossfire, told Hayden in Austin: "The only ones who benefit [from the Drug War] are the criminals, the corrupt bureaucracy, the bankers who launder money protected by the state, and those who invest in prisons, the army, the police, industries of violence and horror." Sicilia told Hayden that the Drug War "has taken more lives, caused more misery, more destruction of democracy, far more than the consumption of drugs has done. It is the opening of the doors to hell." Tom Hayden's August 25 talk at 5604 Manor will be broadcast on Allan Campbell's People United on KOOP 91-7-FM in Austin, Friday, September 14, 1-2 p.m. The show will be streamed live here.